We began the Fall with hurricanes, blackouts, flooding and more. So when we had the chance to have a long weekend get-away in Florida, we took it! 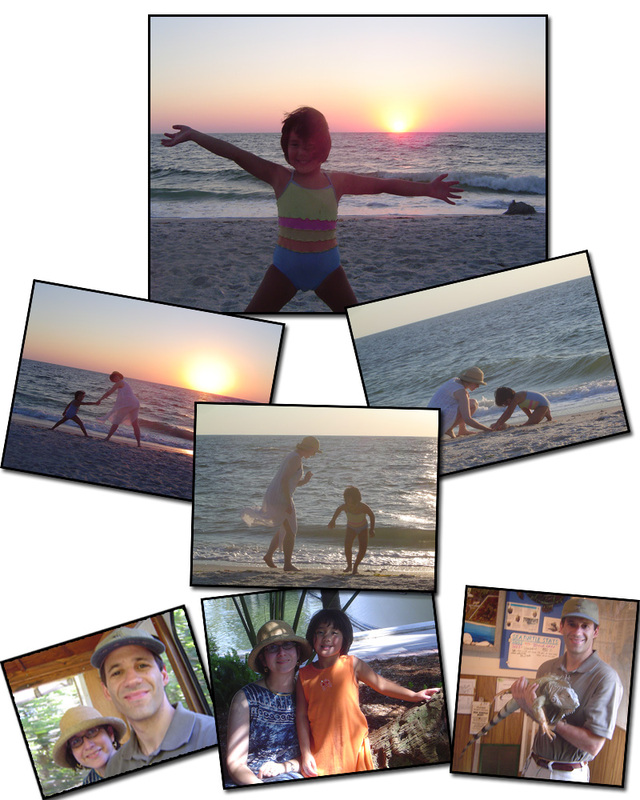 Ben had meetings on Captiva Island, so Dana and Allison joined him for some much needed fun in the sun. The highlights were definitely Sunset Beach (where Dana and Allison were playing in the pictures) and visiting the wildlife refuges (the picture of Ben holding the iguana was actually taken by Dana who was amazed by the animals). Halloween soon followed, and to no one's surprise Dana was again (for the 4th year in a row) a black cat! She dresses up as anything else every other day of the year, but on Halloween her tradition has been to dress up like her beloved cat Pete. This year she had her makeup done by a professional (her "Mommy-Roya") and she went out trick-or-treating with Alana (the princess in the picture). Also in celebration, the week before, we had a pumpkin-carving gathering for Ben's 39th birthday (the picture above barely does justice to the creative pumpkins that were made). 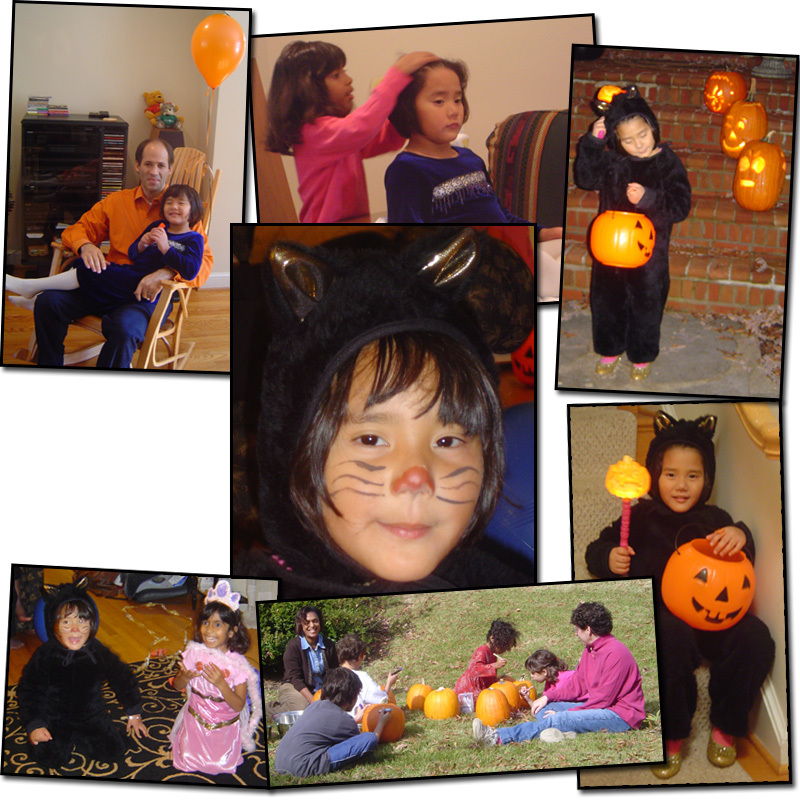 Also while pumpkin-carving, Dana and her friend Alana decided to "do" everyone's hair (see picture at top). The hair-dos were as "creative" as the pumpkins! We then enjoyed our annual "Adoption Reunion" weekend. In the Fall, it has come to be an (almost) yearly event for us to gather with a few of the other families we adopted with in Kazakhstan and to catch up on how everyone is doing. From year-to-year the little ones seem to sprout and grow more wonderful every time we see them! 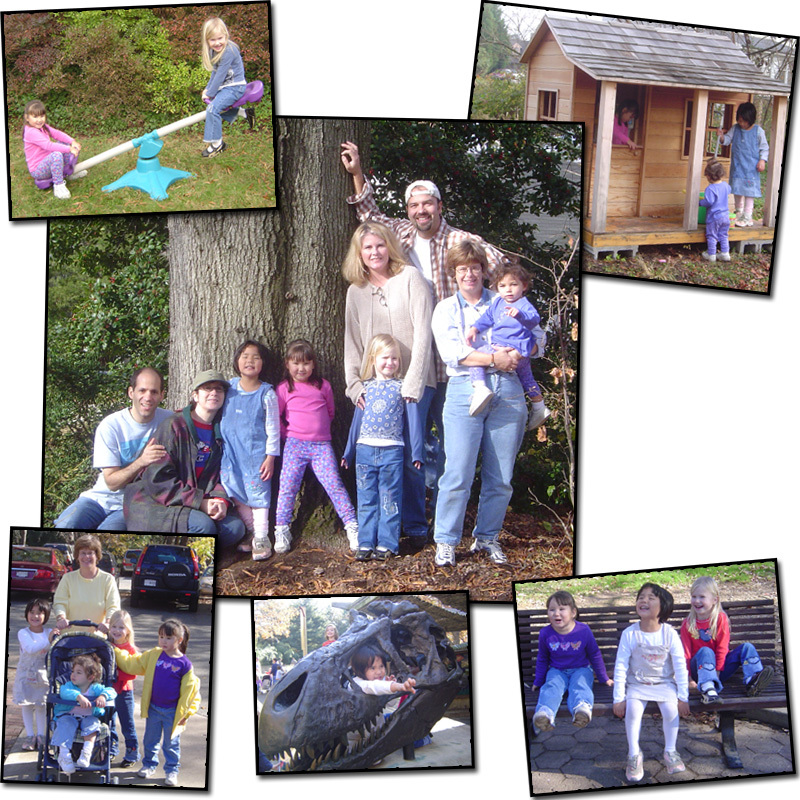 This year the group all came to our house and we had a wonderful weekend spending lots of time at the National Zoo, playing in the backyard, and making homemade pizza. This year we were joined by a new little one-- Emily (the baby in the stroller). She was adopted last year from Russia to be Holly's sister (in the purple shirt). It's hard to believe our little girl is old enough to know what "first position" is, but this Fall she took ballet lessons to find out. Last Summer she came to us to ask if she could have ballet lessons instead of gymnastics, so we agreed. And Dana has flourished! She takes the class with 3 of her best friends, Alana, Asha, and Hanna and she is in heaven. These pictures were taken at her Winter "performance" on the last day of class. As always we enjoyed our Chanukah celebration at Aunt Lauren, Uncle Tom, and cousin Chloe and Phoebe's house. In the picture above Dana and her cousins are enjoying the annual tradition of Ben's potato latkes (as seen above in the making). This year one of Dana's special gifts was her "baby" she's named "Buttercup." Allison managed to find a doll that looks pretty close to what Dana looked like when she was a baby, and Dana was thrilled. 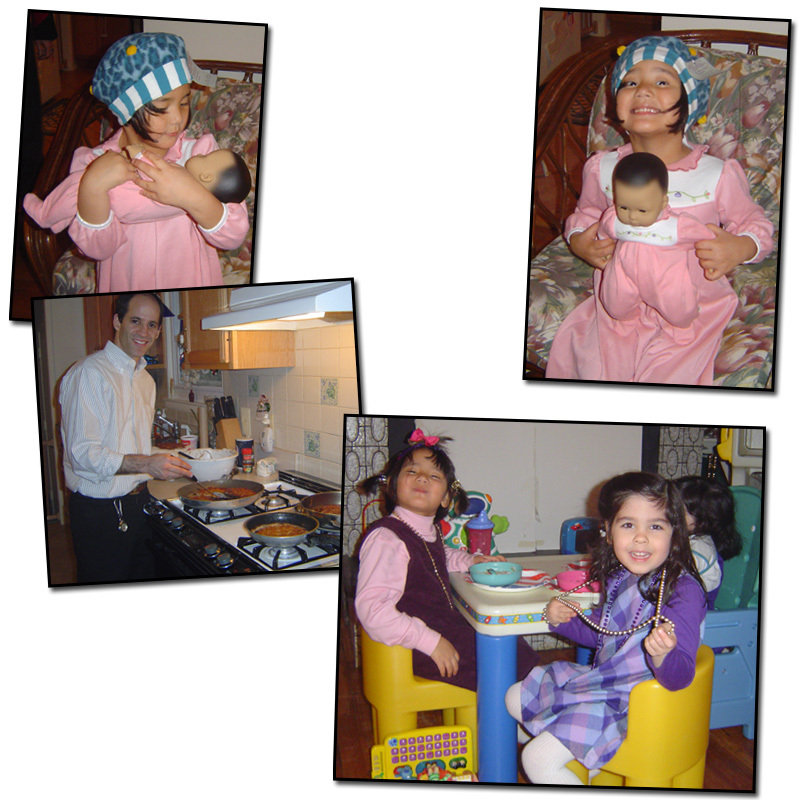 In the pictures above she is proudly wearing her matching pajamas and a hat that Aunt Lauren gave her. What you don't see is how Dana proceeded to wear this outfit throughout her winter travels to visit Ben's childhood friend John and his family, along with our annual extended stay at Grandma Betty and Grandpa Ben's. It was wonderful fun to see how she shared her "baby" with all of her uncles, aunts, and cousins throughout the winter holiday fun! 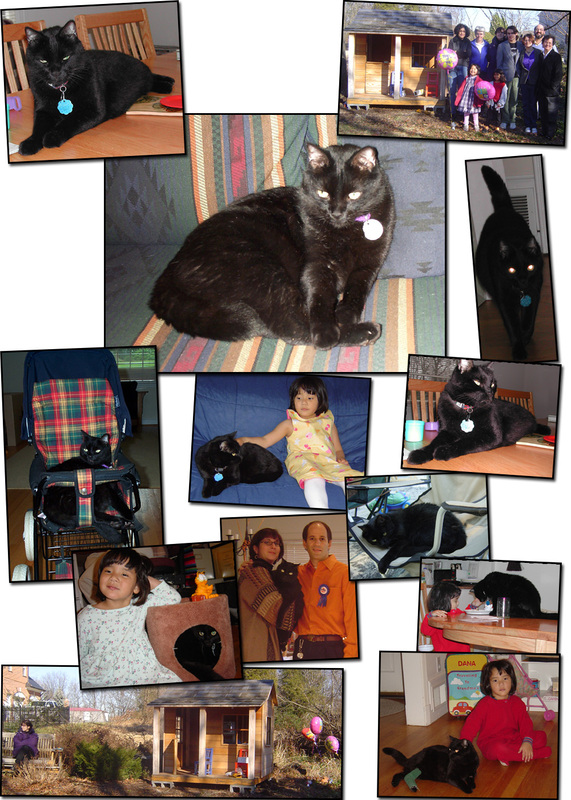 And finally, we ended the Fall, by losing our very special cat Pete. As you can see from the pictures, Dana has spent many wonderful times with Pete while growing up. But after 17 long years (mostly with Allison and Ben), Pete finally passed away. So Dana spent some time making a funeral for Pete in the backyard. We invited friends (see top right), bought balloons (see just above), decorated his box of ashes, and buried Pete next to her playhouse (where she can always see her friend when she needs to). We also planted bulbs in honor of Pete and each time we put a bulb in the hole we thought of one more good thing about Pete. We ended the "Pete Party" by sending off one of the balloons (the heart-shaped one because Dana loved Pete). We will all miss our furry friend, but Dana is looking forward to adopting 2 new kittens in the Spring and continuing to take good care of Shana our other little cat (who is thankfully only nine years old and is still in good health). Needless to say, the cats in Dana's life are an important part of our little family and she has learned many valuable lessons from them. 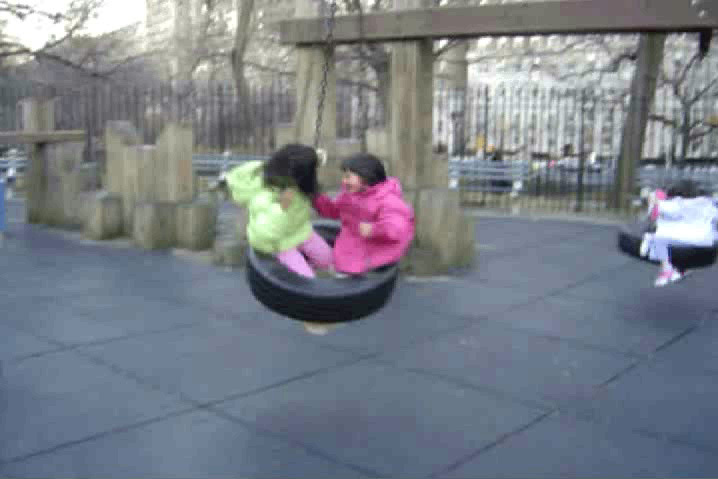 Watch Dana spin with another girl from Kazakhstan she met in a park in New York City (5 meg movie requires Flash plug-in).